We have had some beautiful weather here this last week. I love the summertime and all that comes with it. Tank tops, flip flops, popsicles on the porch, plastic pools from wal-mart, and getting that little touch of pink on your checks from the sun is one of my favs. While Ella was napping one day last week I decided to fill up some water balloons for her to play with when she woke up. She was a little timid at first. She slowly touched them and finally picked one up. Then she began to squeeze so we headed outside with them. 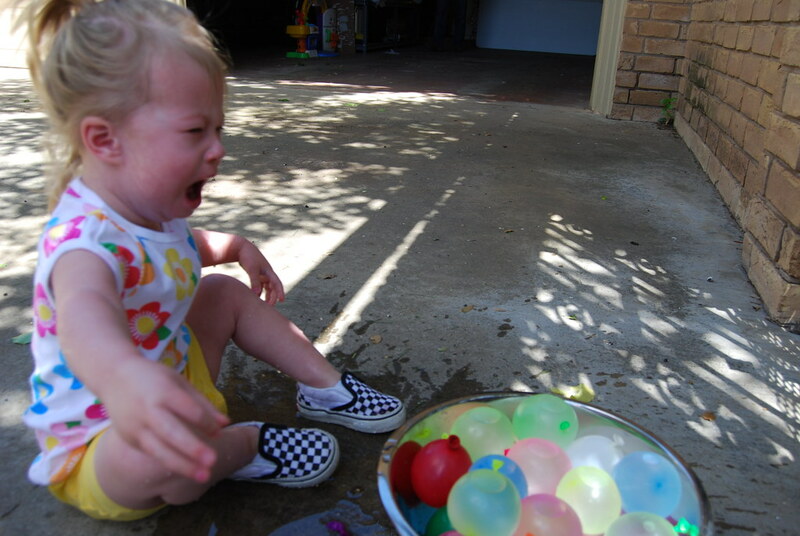 She was obviously unaware of the fact that when you squeeze a water balloon hard enough it pops. Ella was very upset when the balloon popped and got her wet. I couldn't help but laugh and take a picture of course. Bob came to the rescue and showed her how to throw a water balloon and how much fun it was to make them pop. She loved it and cracked up every time one would pop. Last weekend was a special day for Bob and I. May 1st was our 6 year wedding anniversary. I can't believe it has been 6 years already! I feel like just yesterday I was walking down the aisle in my baby blue nike shocks...crazy how fast time flies! 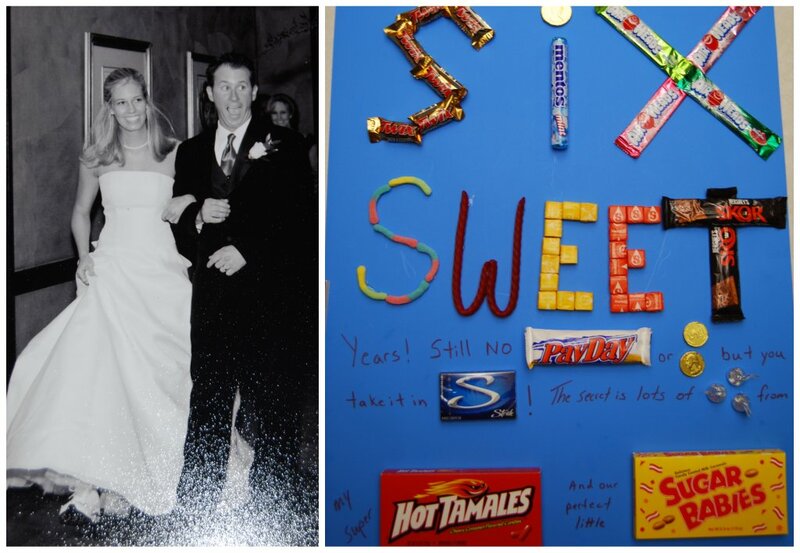 I woke up to this very thoughtful candy card made by my wonderful husband. He knows me so well:) I married the most amazing man and these last 6 years have been blissful. Bob makes me laugh like no one else can and I couldn't be happier. I love you Bob. Happy Anniversary. I love the hair cuts, so cute and such a sweet memory! The water balloon is priceless and the wedding day is still so fresh in my mind. Such a beautiful day!! I love you. Aw, that is so sweet! We are so glad that we're getting to know you guys better! You are such a fun mom! Who gets to wake up to water balloons?? And your relationship with Bob is amazing and truly one to be admired. Love yall and your sugar baby,Ella. Allison - seriously you are the most beautiful bride ever!! You and Bob seem so perfect for each other. Hope we see you both again soon!! Happy Late Anniversary! That photo of the popped balloon is hilarious. How come you didn't warn her? Just kidding. Love the water balloon story! Let's do that together soon! I am certain Kinley would cry too. Happy Anniversary! I remember that day like it was yesterday. If it is possible...I think you are even more beautiful today!